Is it rather silly for me to spend hours analyzing an official new photo of Clarke Griffin from Season 3 of The 100, representing one still of one moment among 40 minutes of an episode of television we won’t see until early 2016? Absolutely. But the official photo of her that show runner Jason Rothenberg shared has sparked widespread interest and creative assumptions, so naturally I feel compelled to apply my own perspective. If you have not yet watched Seasons 1-2 of The 100…why not? Here is my strong spoiler-free recommendation to catch up before Season 3. Also, SPOILERS from the first two seasons contained in the article below! If you are caught up, here is my extensive analysis of S1-2. *FULL Disclaimer/disclosure: Thanks to Jason, I am lucky enough to have seen actual footage of Season 3, but I am sworn to secrecy and would never spoil anything for fans. It would be disingenuous of me to post theories about what I have actually seen, so I promise you that the following is honest speculation about every aspect of Season 3 that I know nothing about! When we last saw Clarke Griffin at the end of Season 2 on The 100, she was heading out alone on a walkabout to deal with the ramifications of what she had to do in order to save the people that she loves (decimate an entire other community of people via radiation). The show returns for Season 3 in January or February of 2016, and our very first look at Clarke will be three months later (time jump confirmed by Rothenberg at SDCC). The new photo features Clarke at a future unknown time and location, but one thing is abundantly clear: the woman has finally enjoyed a bath or shower. Post-apocalyptic luxuries, few and far between! Thanks to years of watching and writing about LOST, my brain is trained to look above, beyond, and deep beneath what is presented on screen. Upon first glance at Clarke 3.0, I of course took note of the unusual eyeshadow and new hairstyle. 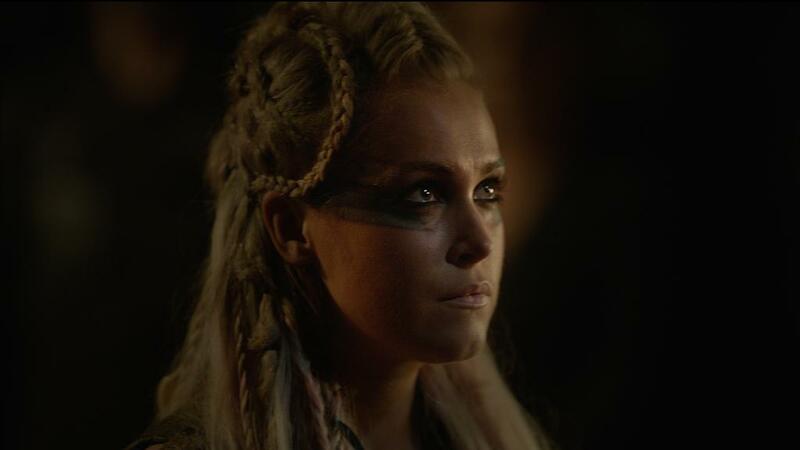 Many were quick to ascertain that Clarke is wearing the smudged eye makeup we are used to seeing on Grounder warriors, perhaps even a variation of Commander Lexa’s war paint. 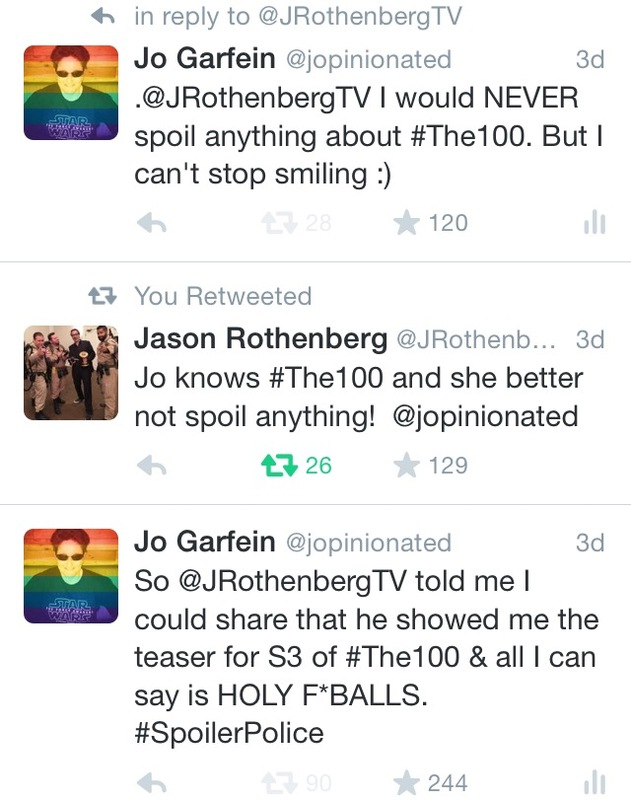 But the pattern, placement and colors are different from what we’ve seen on the Grounders. Keep in mind that there are 12 different clans on The 100, and that we’ve only met the Grounder/Tree clan thus far. I have no clue what Clarke’s eye makeup represents in this photo, if anything, but my best guess is that she is wearing it out of respect for whomever she is in the shared company of. I imagine that her hair is also styled with the braids representing whatever clan/village she is currently visiting. Whether Clarke is in this undisclosed location under duress or of her own free will is a question that we will have to (im)patiently wait to be answered. Frankly, I am fascinated more by what I perceive to be conveyed in Clarke’s eyes in this photo; I am not as interested with WHO she is looking at, but HOW she is observing what is in front of her. As we all know, Clarke Griffin is quite astute and determined, and in this particular moment she appears to be absorbing the target of her incredible focus with great interest. Without a doubt, her eyes are cast up at someone or something, and as most thrones and leadership platforms are elevated, I would assume that Clarke is in the presence of greatness. My prediction is that it will be someone nefarious, although I could be wrong (and often am). Two clear candidates would be the Ice Queen or Lexa, but this show has outplayed us before with blissfully surprising sleight-of-hand character maneuvering. I am an unabashed fan of Clarke (see The Rise and Reign of Clarke Griffin) and have spent many hours contemplating her role both on the show and in the television landscape. My gut reaction to this new photo of her is to posit that she continues to muster every ounce of strength left in her fractured heart to remain stoic and not reactionary, regardless of the information being disseminated. If Clarke is indeed being held captive or surrounded by enemies, any trace of formerly heart-on-her-sleeve may be replaced with a fierce external fortress that she hopes won’t be betrayed by the truth lingering behind her expressive eyes. For Clarke, life IS about more than just surviving. It always will be. She has become one of the most resourceful human beings on the planet. It would not be farfetched to suggest that her skills as a healer may have been used as a bargaining chip while she was out on her own for several months, leading up to the moment in this photograph. All we know for sure is that Clarke left on a walkabout with a broken soul, battling demons that will provide unwanted company for the rest of her life. But she is alive, and wise beyond her years. Whenever and wherever we see her next, I expect that Clarke will have at least attempted to heal and mend the emotional lacerations to her head and her heart. In my wildest dreams I imagine that in the full view of Clarke in the moment illustrated in this new photograph, she is wearing the clothes of another but comforted by stealth daggers sheathed strategically along her body for quick access; biding her time while creating mental blueprints of every room and committing them to memory for future escape routes. Taylor Swift can have her nice dress, red lips and rosy cheeks. I prefer to imagine Clarke Griffin in leather warrior gear, with facial scars that speak volumes of her brief time on Earth and eyes burning for truth, peace, safety, and an occasional ounce of flesh and desire. Permit me to take you further down a rabbit hole of convoluted conjecture (my specialty). In my opinion, after her actions at Mount Weather, all of the clans will equally revere and fear Clarke Griffin; holding in high regard and respect the girl who fell from the sky to become the woman who led her people to destroy the 12-clan common enemy in the mountain. My point is that is it easy to jump to myriad conclusions about her current predicament based upon one photo from an entire season of television that we have yet to see. For me, the joy is in the months of reflection and guesswork during the hiatus. I do not expect The 100 to end with Clarke Griffin as the queen of the world, or what is left of planet Earth. But I do expect her ascension into greatness to continue, as well as the unyielding fealty to her original people from the Ark – regardless of where she winds up living or leading when all is said and done. I strongly feel as though Clarke is en route to becoming a legend, both on the show and in the future television hall of fame featuring the best action/sci-fi heroes in character history. Honestly, I think that Eliza Taylor is going to be astonishing in Season 3 of The 100. No pressure, but there is only room to improve upon what she has already brought to life on screen so vividly as Clarke Griffin. Very few actors on television are delivering at the level she is, week after week and season after season. And now, please join me as we go off the rails…a teaser for the shape of things to come in my next article. It is no secret that there will be a conclave at some point on The 100. Earlier this year, Jason Rothenberg (accidentally) mentioned it on Twitter when responding to fan art of Anya with young Lexa. A conclave is essentially a private meeting, and in the Roman Catholic Church, a conclave is held to elect a new pope. On The 100, it is my understanding that the Commander of the Twelve Clans is reincarnated, and that the transmigration of the previous Commander’s soul was passed along to Lexa. I would be remiss if I didn’t connect the dots and hypothesize that the conclave on The 100 must be connected to this concept. But truthfully, that is an entirely separate opus that I will be posting before Season 3 airs. SIDE NOTE: I have been working on a massive The 100 theory for several months about technology vs. nature, connecting ALIE, Lexa, Clarke, Jaha and…The Matrix – to the point where I’ve become a crazy person using a white board to help map out my thesis. To be fair, I may also be submitting a paper about this theory to present at an upcoming pop culture conference, so I am taking the time to explore all angles. Stay tuned for Part 2 of my early Season 3 The 100 analysis, which will be posted in the next month or so! Fair warning that it will be quite lengthy, and many other rabbit holes will be explored in depth. When S3 begins, I will be posting extensive analysis and theories here after each new episode! In the meantime, you can find me talking about and promoting The 100 on Twitter @JOpinionated. The 100, starring Eliza Taylor, Paige Turco, Marie Avgeropoulos, Bob Morley, Christopher Larkin, Devon Bostick, Isaiah Washington, Ricky Whittle, Lindsey Morgan, Richard Harmon and Henry Ian Cusick, returns for Season 3 in early 2016 on The CW.